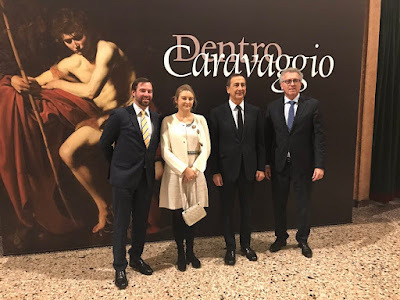 Hereditary Grand Duke Guillaume and Hereditary Grand Duchess Stéphanie were on a mission today, a finance mission in Milan that is. The main item on their agenda was a seminar hosted by Luxembourg for Finance in cooperation with the Italian-Luxembourg Chamber of Commerce (CCIL) entitled "Luxembourg, Connecting You With Financial Expertise". The Hereditary Grand Duke gave the opening remarks for the event also attended by the Minister of Finance Pierre Gramegna. Already last night, the Hereditary Grand Duke and Hereditary Grand Duchess as well as Minister Gramegna visited the "Inside Caravaggio" exhibition at the Palazzo Reale alongside the Mayor of Milan Giuseppe Sala. The cour offers another picture of today with hopefully more to come.